Two aspects of the DCAT-AP-DONL 1.1 application profile deserve further elaboration, as they are a considerable change from either DCAT-AP-DONL 1.0 or DCAT-AP-NL 1.1. This is done below. The value of a dataset identifier is the original identifier of the dataset. This value must be preserved when this dataset moves across dataportals. This ensures that the dataset, regardless of the dataportal it currently resides in, can always be uniquely identified. To communicate that a dataset is or has been present in a dataportal, the dataportal may elect to include its own internal identifier of the dataset as a part of the alternativeIdentifier property. In the event that changes are made to a dataset that are not made by the original authority or publisher, the identifier property is invalidated. At this point the value of the identifier property is the identifier of the dataset that that dataportal currently maintains. 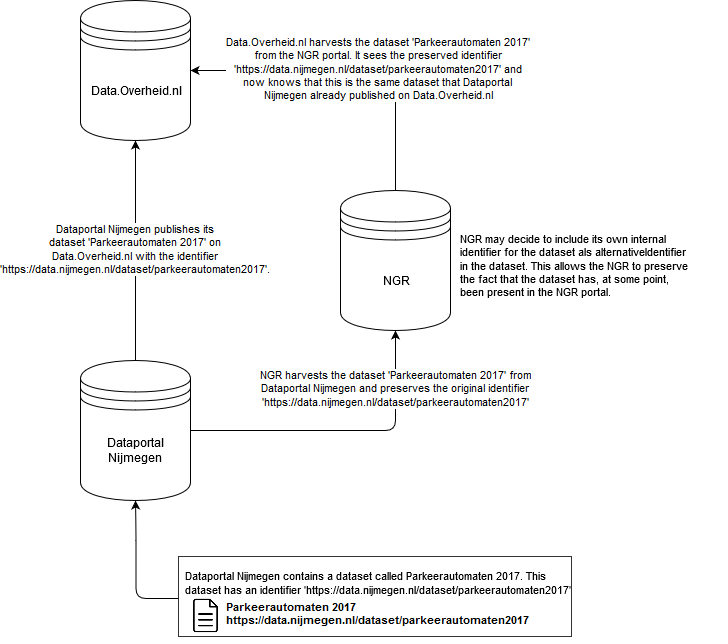 In the above example, should NGR make changes to the dataset, then the internal identifier that NGR maintains for the dataset becomes the identifier of the new dataset. DCAT-AP-DONL mandates that the metadata of a dataset is provided in only one language. In order to provide metadata in multiple languages for a single dataset, the following steps must be taken. By declaring your dataset with the same identifier and stating that the new dataset is a version of the original dataset you signal that the datasets are identical and that only the metadata is different. Ensure that the different datasets have unique metadataLanguage properties. In short: group all the resources with metadata in the same language under one dataset, which metadataLanguage matches that of the resources. When the dataset becomes available in a new language , create and maintain a separate dataset and resources for the new language. The actual accessURLs and downloadURLs can be the same across both datasets.